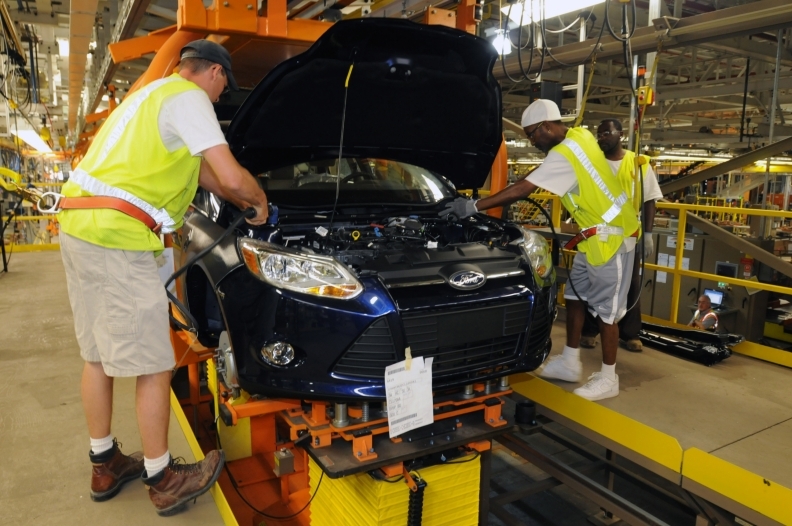 Workers build pre-production 2012 Ford Focus models at the automaker's Wayne assembly plant in Michigan in August. Ford purchased $2.7 billion worth of goods from Tier 1 minority- and women-owned companies last year, while providing over $150 million in new business to minority- and women-owned suppliers. DETROIT -- Ford Motor Co. will likely exceed its annual goal to spend 10 percent of its U.S. purchasing budget on minority- and women-owned supplier companies, the automaker said. Though Ford said it maintained its 10 percent goal in 2009 by purchasing $2.7 billion worth of goods from Tier 1 minority- and women-owned companies, it was still a significant decline from $3.3 billion in 2008 and $4.2 billion in 2007. Ford attributes the drop in the dollar amount to the decline in industry production volumes over the past few years. “These are difficult times for all auto suppliers, but minority- and women-owned businesses face their own set of unique challenges,” Tony Brown, Ford group vice president for global purchasing, said in a statement. “Because of this, Ford took proactive action to offer our diverse suppliers significant business opportunities, while at the same time providing support to others to improve their chances for long-term viability,” he said. • Facilitated the sale of a portion of Meridian Automotive Systems business to Flex-N-Gate Corp. The sale expanded Flex-N-Gate's product line by adding exterior vehicle lighting systems. Flex-N-Gate, of Urbana, Ill., is an Asian-American supplier. • Supported Grupo Antolin Wayne by transferring a significant piece of interior headliner business from a mainstream supplier. Grupo Antolin Wayne, of suburban Detroit, is an African-American supplier. • Sourced a global parts distribution contract to AEL-SPAN/UTi, an African-American supplier in Belleville, Mich.
• Upgraded Husco International, a Hispanic supplier, to Tier 1 status from Tier 2. As part of the upgrade, Ford sourced new powertrain manufacturing business to Husco, of Waukesha, Wis.
Flex-N-Gate Corp. ranks No. 12 on the Automotive News list of the top 150 suppliers to North America with $2.25 billion in parts sales to automakers in North America in 2009. Flex-N-Gate makes stamping and mechanical assemblies, plastic and steel bumpers, fascias, lighting and other exterior elements. Grupo Antolin Wayne is a unit of Grupo Antolin North America Inc., which ranks No. 86 on the Automotive News list of the top 150 suppliers to North America with $328 million in parts sales to automakers in North America in 2009. Grupo Antolin makes overhead systems, door function and seat function products. In 2008, Ford created what it calls the Joint Technology Framework under which the automaker provides key technologies to preferred suppliers in order to give both parties a competitive edge in the market. That program is a part of Ford's Aligned Business Framework, Ford's term for its designated preferred suppliers. The automaker offers long-term collaborative relationships, more-than-customary details about Ford's future production schedules and first shot at new business to its ABF suppliers. • Zubi Advertising, Ford's Hispanic agency of record, in Miami.